One of the best-known, most frequently performed of modern plays, displaying Ibsen’s genius for realistic prose drama. 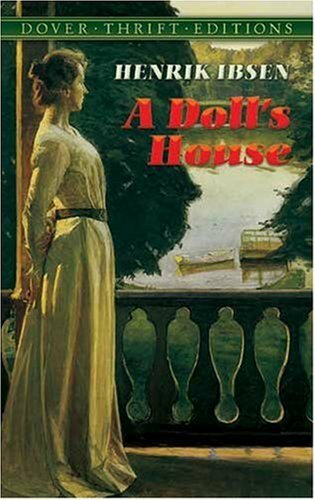 A classic expression of women’s rights, the play builds to a climax in which the central character, Nora, rejects a smothering marriage and life in "a doll’s house." Publisher’s Note. Contents. Dramatis Personae. 1864, exhausted and enraged by the frustration of his efforts toward a national drama and theater, he quit Norway for what became twenty-seven years of voluntary exile abroad. In Italy he wrote the volcanic Brand (1866), which made his reputation and secured him a poet's stipend from the government. Its companion piece, the phantasmagoric Peer Gynt, followed in 1867, then the immense double play, Emperor and Galilean (1873), expressing his philosophy of civilization. Meanwhile, having moved to Germany, Ibsen had been searching for a new style. With The Pillars of Society he found it; this became the first of twelve plays, appearing at two-year intervals, that confirmed his international standing as the foremost dramatist of his age. In 1900 Ibsen suffered the first of several strokes that incapacitated him. He died in Oslo on May 23, 1906.